Puck drop: 8 p.m. Saturday. TV/Radio: ESPN2/Westwood One Radio, SiriusXM College Sports Nation channel 84. Records: UMass 31-9-0, Minnesota Duluth 28-11-2. Coaches: Greg Carvel, eighth season, 139-136-22 (53-58-4 at UMass); Scott Sandelin, 19th season, 368-311-87 at UMD. Leading scorers: Cale Makar, a defenseman, leads UMass with 16 goals and 33 assists, and is Hockey East’s leading scorer. Jacob Pritchard has 16 goals and 31 assists, and Mitchell Chafee has 18 goals and 24 assists. Parker Mackay and Justin Richards each leads UMD with 31 points. Mackay, a right wing, has 15 goals and 16 assists, and Richards, a center, has 12 goals and 19 assists. Netminders: UMass: Filip Lindberg, 11-3-0, four shutouts, .937 save percentage, 1.50 goals-against average. UMD: Hunter Shepard, 28-11-2, six shutouts, .922 save percentage, 1.80 goals-against average. Road to the final: UMass earned an at-large bid and the No. 1 seed in the NCAA Tournament’s Northeast Region in Manchester, N.H. The Minutemen defeated Harvard, 4-0, then beat Notre Dame, 4-0, in the regional final to reach the Frozen Four. Marc Del Gaizo's goal with 4:42 left in the first overtime gave the Minutemen a 4-3 win against Denver on Thursday at KeyBank Center, and put the Minutemen into their first national championship game. UMass led 3-1 before the Pioneers tied the game with a pair of goals in a span of less than six minutes in the third period. Minnesota Duluth is the defending national champion and enters the title game on a seven-game winning streak. 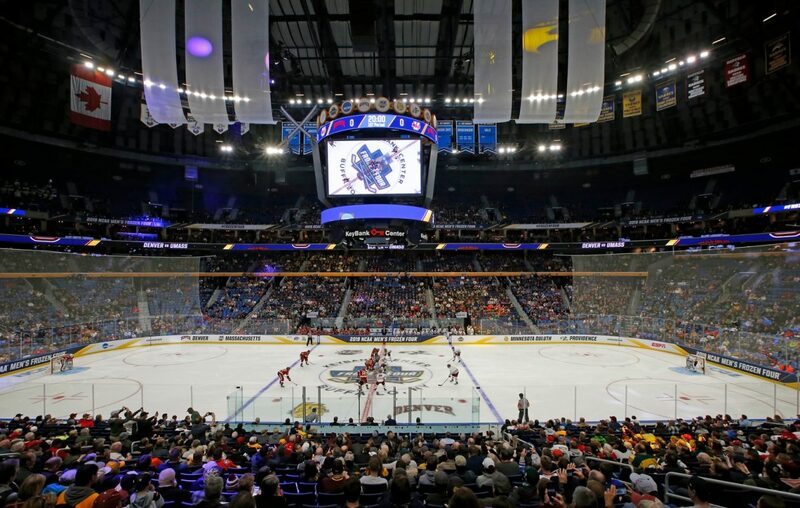 The Bulldogs won the National Collegiate Hockey Conference tournament championship, then defeated Bowling Green 2-1 in overtime in the first round of the NCAA Tournament and Quinnipiac 3-1 in the Midwest regional final. UMD defeated Providence 4-1 in a national semifinal Thursday. Justin Richards scored two goals for the Bulldogs, and Billy Exell scored the go-ahead goal midway through the third period. Blue line: UMass has two NHL draft picks in its lineup: defenseman Makar (Colorado Avalanche) and defenseman Mario Ferraro (San Jose Sharks). UMD has seven NHL prospects in its lineup: left wings Noah Cates (Philadelphia Flyers), Cole Koepke (Tampa Bay Lightning) and Riley Tufte (Dallas Stars); right wing Nick Swaney (Minnesota Wild); and defensemen Dylan Samberg (Winnipeg Jets), Scott Perunovich (St. Louis Blues) and Mikey Anderson (Los Angeles Kings). In the crease: The Minutemen have two of the nation’s top special teams units. UMass is second on the power play (40 for 142, 28.2 percent) and fourth in penalty killing (18 for 144 , 87.5 percent). Against Denver, the Minutemen killed off a pair of five-minute majors, and scored three power-play goals, including a pair of five-on-three goals in the first period. Minnesota Duluth's defense, however, has been its hallmark. The Bulldogs are fourth in the nation in scoring defense, allowing an average of 1.95 goals per game. UMD also has athleticism, size -- defensemen Samberg and Nick Wolff are each 6-foot-4 -- and a scoring touch, as Perunovich leads the Bulldogs defense with three goals and 26 assists, and Anderson has five goals and 20 assists. Roughing: UMass will be without right wing Bobby Trivigno, who was suspended for the national championship game, following an unpenalized hit to the head of Denver’s Jake Durflinger in the third period Thursday. The suspension was announced Friday. Trivigno has scored 13 goals and 15 assists in 39 games as a freshman. Faceoff: Faceoffs, literally, will be a key matchup between the Bulldogs and the Minutemen. UMD controlled the draws against Providence, winning 40 of its 62, a point that Providence coach Nate Leaman considered critical in the Bulldogs’ win against his team. UMass, meanwhile, won its semifinal despite winning only 28 of its 66 faceoffs. From the point: UMass continues a historic run for its program, especially considering the Minutemen won only five games two seasons ago. UMass won its first Hockey East regular-season championship and was ranked No. 1 for the first time. The Minutemen also reached the Frozen Four for the first time, and made the NCAA Tournament despite being eliminated from the Hockey East playoffs in the semifinals. Minnesota Duluth is playing in its third consecutive Frozen Four, and its third consecutive national championship game. Denver defeated the Bulldogs in the 2017 national championship game, and the Bulldogs defeated Notre Dame for the 2018 national title. The Bulldogs also won the 2011 national championship, and aim to become the first program to win consecutive titles since Denver in 2004 and 2005.